David Tilson, Dufferin-Caledon MP and a supporter of the Festival all these years, took the stand to comment on his appreciation for the value, musically, artistically and financially to the town and the region. He wanted to convey his decision to step down from politics, saying, “I'm out.” Meanwhile, he wished the best for the Festival in the coming years. 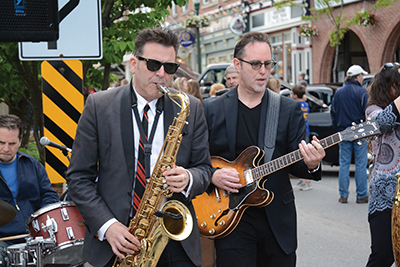 One of the largest contributors over the last 11 years, the Downtown Orangeville's businesses and merchants are well aware of how much the influx of the thousands of people who come to the festival, benefits the business community and the community of the town overall. Heritage Canada is providing financial support to help showcase “our outstanding local performers, which has become such an important part of the Festival's programming,” Mr. Leitch told the attendees. He added, on behalf of the Festival, their appreciation for the continued support of the Ontario Trillium Foundation and the County of Dufferin. The Opera House takes its part on Saturday, opening its doors just before noon to feature “an extremely rare appearance by Halifax's incredible Garrett Mason,” as well as others.